Yusen Logistics has been named the 2015 Cargo Consolidation Business Partner of the Year by Walmart México y Centroamerica. This marks the fourth year in a row that the third-party logistics provider (3PL) has received this recognition for its Origin Cargo Management (OCM) services. The team from Yusen Logistics and Walmart Mexico. 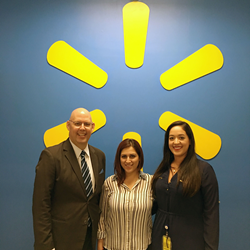 From left, Jordan Dewart, Yusen Logistics Mexico; Evelyn Leal, Walmart México y Centroamerica; Laura Del Castillo, Yusen Logistics. “It is an honor to have received the Cargo Consolidation Business Partner of the Year Award for the past four consecutive years,” says Jordan Dewart, President, Yusen Logistics Mexico. Yusen Logistics has been named the 2015 Cargo Consolidation Business Partner of the Year by Walmart México y Centroamerica. This marks the fourth year in a row that Yusen Logistics has received this recognition for its Origin Cargo Management (OCM) services. Jordan Dewart, the newly-appointed President of Yusen Logistics Mexico, accepted the award at Walmart’s Annual Carrier Conference for Latin America, which was recently held in Mexico City. He was accompanied by Wei Ting, Hub Manager, OCM, Yusen Logistics (Americas) Inc., and Laura Del Castillo, Key Account Manager, Yusen Logistics Mexico. The Cargo Consolidation Business Partner of the Year Award is based on key performance indicators, including accuracy of data transmission, on-site personnel excellence, origin country responsiveness, peak season performance and innovation. Yusen Logistics has been partnering with Walmart México y Centroamerica for six years, providing warehousing, consolidation and origin cargo management services. Yusen Logistics is a global logistics and transportation provider that delivers custom supply chain solutions through one of the largest air, ocean and land transportation networks. We have over 500 offices in 42 countries and regions, with more than 20,000 employees at your service. Combining our services gives you greater control over your supply chain. For more information, visit yusen-logistics.com.